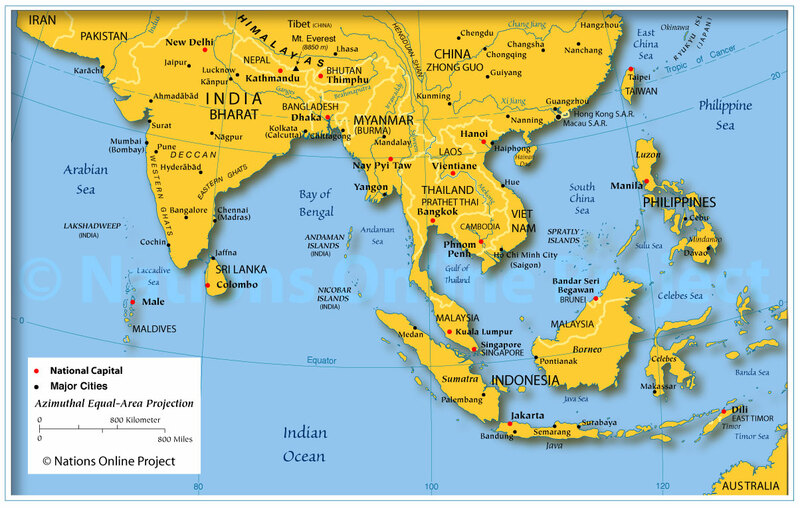 Southeast Asia is a subregion of Asia, roughly be described as geographically situated east of the Indian subcontinent, south of China and north of Australia, between the Indian Ocean (in west) and the Pacific Ocean (in east). It consists of two distinctive different geographic regions, one is mainland Southeast Asia, also known as Indochina, on the Indochinese peninsula; it comprises the countries of Cambodia, Laos, Myanmar (Burma), Thailand, Vietnam and West Malaysia (Peninsular Malaysia), the other is the Malay Archipelago, or Maritime Southeast Asia, which comprises the countries of: Brunei (on the island of Borneo), East Malaysia (with the Malayan states of Sabah and Sarawak on the northern part of Borneo), all the islands of Indonesia, the Philippines, Singapore and Timor-Leste (East Timor). Southeast Asia together with the Indian subcontinent and lowland southern China forms the Indomalaya ecozone, one of the eight great ecozones that cover the Earth's land surface. Clickable map of countries in Southeast Asia. Click on the map to get to the respective country information page, or use the links below. Country maps will be found at the respective country pages. Map showing the countries and regions of South East Asia with borders, main cities and capitals.